“We wanted to take advantage of the commercial demand, grow a sustainable business, and help this product reach its full potential,” says Wilson. He and Knox struck a deal with the university to commercialize the product and set up shop at Startup Edmonton. There, the two transformed DrugBank from an academic resource into an online business. While researchers and the general public can still access a great deal of free information (“It’s in our DNA to make information available,” says Knox), commercial users must purchase a license in order to use the data and gain access to additional datasets. 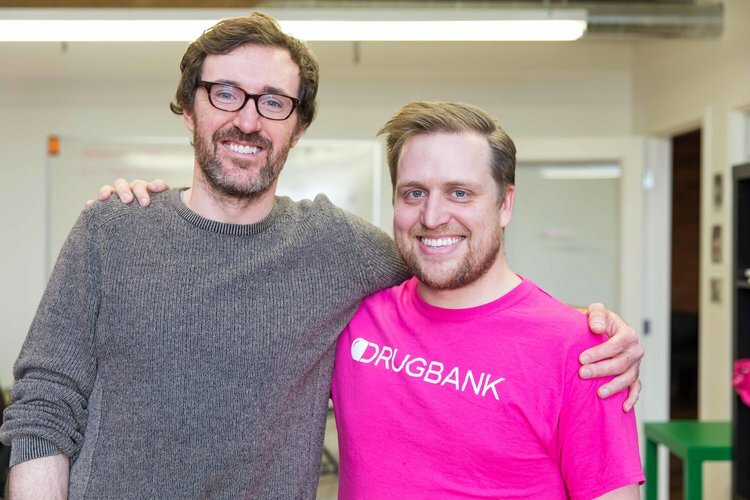 Now DrugBank’s commercial clients include some of the largest pharmaceutical companies in the World, as well as mid-sized companies, a growing number of pharma startups, and companies providing scientific reference software. “The value for the users is saving time by finding the information in one place,” says Wilson. Each month, a million users visit the site, making DrugBank the most popular drug database in the World. It’s also the most comprehensive resource of its kind, including information on more than 20,000 individual drugs (not just approved drugs, but drugs in clinical trials and drug formulas that show potential), hundreds of thousands of different drug products, and half a million drug interactions. Since pharma research is advancing rapidly, the database must be continually updated with new information. To do this, the company uses a team of nine ‘biocurators’ — representing pharmacy, medicine, biochemistry, and other fields — who comb the academic literature for new information to add to the resource daily. Since taking their entrepreneurial leap three years ago, Knox and Wilson have taken advantage of many of the resources offered by Startup Edmonton. The organization’s mentorship and support opportunities (especially the Preflight workshop series) have helped them get a handle on basic business principles and lay the foundation to build a scalable global technology product, and running their company from the organization’s downtown facility has connected them with a network of diverse entrepreneurs.